Memorial Day and the start of summer is almost upon us and you know what that means, right? Yep, it’s burger time. That’s why it makes perfect sense that National Hamburger Day this year is on Memorial Day, May 28, 2018. Now while no one really knows when the first National Hamburger Day was first instituted, there is no denying that burgers are a staple in the American diet. Did you know that Americans eat almost 50 billion burger a year? That means most of us are eating burgers more than once a week. That is a lot of burgers. Depending on who you talk to, there are several contenders connected to the invention of America’s favorite sandwich. And the origin stories date back to ancient Egypt where they are said to have eaten ground meat and to Genghis Khan and his “Golden Horde” who ate raw meat patties of lamb or mutton when out on military campaigns. Then when Genghis Khan’s grandson Khubilai Khan invaded Moscow in 1238, the Russians adopted it into their cuisine calling it “Steak Tartare”. And from there it eventually came over to Europe. Others prefer to start the story of the origins of the hamburger in Hamburg, Germany where they had a strong cattle industry and their own version of the steak called the “Hamburg Steak”. When Germans began immigrating to the United States in the 18th and 19th Centuries, food stands and restaurants began offering a steak cooked in the Hamburg style. The dish was simply shredded beef with regional spices and would be eaten cooked and raw. But how did it turn into a sandwich? One particular story states that the hamburger came to America at this time when European emigrants came here on ships run by the Hamburger Lines. On these ships the passengers were apparently served meat patties cooked on a grill and served on two pieces of bread. Another story that has been passed down is that it was at the Delmonico’s Restaurant in New York in 1800s that the hamburger first showed up on an American menu. Another contender for the inventor of the hamburger is Charlie Nagreen of Seymour, Wisconsin who at the age of 15 sold hamburgers from his food stand at the Outagamie County Fair. The story says that he first started trying to sell meatballs, but people weren’t buying them and he thought it might be because it was difficult to eat while walking around so he flattened the meatballs and served them between bread. Seymour, Wisconsin claims to be the “Home of the Hamburger” and they hold a burger festival every year. Another big contender is Frank and Charles Menches from Akron, Ohio. Their family claims that the two brothers invented the hamburger while traveling in a 100-man concession circuit to different events in the Midwest in the 1880s. The story goes that while they were working the Erie County Fair in Hamburg, New York, they ran out of pork and so ground up beef and mixed it with spices and served it as a sandwich. They didn’t know what to call the sandwich so took inspiration from the town they were in and called it the hamburger. Louis Lassen of New Haven, Connecticut is also said to have served the first burger in 1900 at his luncheonette called Louis’ Lunch Wagon. He is said to like to ground up scraps of beef and serve it between two pieces of toast to busy factory workers on the run. What started as a way to save money became a new popular sandwich. The hamburger really grew in popularity though after the 1904 World’s Fair in St. Louis, Missouri after Fletcher Davis from Athens, Texas, began selling hamburgers from his stand at the fair. It was a sandwich he had been selling back home in Athens. He would grill raw hamburger steak until it was crispy on both sides and then place it between two pieces of toast with a piece on raw onion on top of the meat. While the jury is still out on who developed the hamburger, Walter Anderson of Wichita, Kansas is said to be the first to develop buns to serve the hamburger patties on. He along with Edgar Waldo “Billy” Ingram founded the White Castle Hamburger in 1921 which is the oldest hamburger chain in America. Luckily celebrating National Hamburger Day is a lot easier than it is to pinpoint the actual inventor of this American favorite, especially this year when it falls on Memorial Day, a popular day for barbecuing as it is. 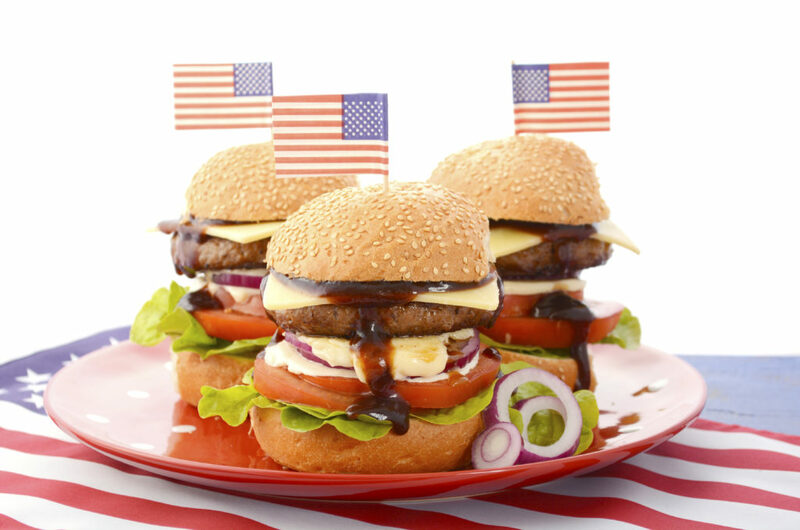 Host a backyard barbecue with your family and friends where the hamburger is the star dish on the menu. Impress everyone with your knowledge of burger facts. Like that fact that the world’s biggest burger weighed 2,014 pounds and needed to be flipped by crane. Or the fact that one of the most expensive burgers in the world made by Juicy Foods in Corvallis, Oregon, consists of 777 pounds of meat and costs $5,000. Attend a burger festival near you. With it being Memorial Day weekend, even if you can’t find a burger festival per se, there will be plenty of good burger eats at all the holiday festivities near you. Celebrate the creativity of the hamburger. What probably has allowed the hamburger to enjoy such long lasting popularity besides the taste that is, is all the burger variations that are possible. So celebrate the diversity of the burger by serving some up with out of the box toppings like Mac & Cheese or Avocado or even an egg. If you are a vegetarian but still can’t resist a good burger, then serve up some veggie burgers instead. If one day is not enough to celebrate the goodness of the burger, come out to Zac’s Burgers in on E. MacDade Blvd. in Folsom, PA on Sunday, May 27 between noon and 1 p.m. for their National Hamburger Day Giveaway. In honor of National Hamburger Day, Zac’s Burgers is giving the first 25 people in line a free cheeseburger or hamburger. Find out more here.